Like most sectors, public libraries are being dramatically affected by a world of rapidly changing technology. Savvy consumers are beginning to expect the organizations that they interact with to have increasingly sophisticated web presences. In order to compete for their patrons’ attention, and better serve their communities, some public libraries are beginning to enter into the realm of “Web 2.0,” reaching out to users in new ways. The Library Research Service (LRS) recently concluded a study, U.S. Public Libraries and the Use of Web Technologies,1 which sought to determine the extent to which public libraries across the nation are adopting specific web technologies ranging from the most basic—having a web presence—to more recent technological developments such as having a presence on various social networking sites. In the spring of 2008, LRS staff members scoured the web sites of nearly 600 public libraries in the United States, looking for the existence of these technologies. The study included all public libraries in Colorado, giving us the opportunity to see where Colorado’s libraries stand relative to their counterparts nationwide in terms of web technology implementation. There were a few areas where Colorado’s public libraries far outpaced their peers in the rest of the country. 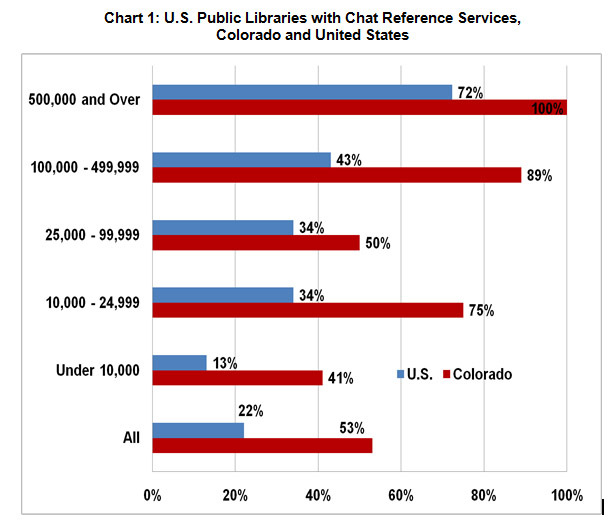 Most notably, Colorado’s public libraries were well over twice as likley to provide a chat reference service than the public libraries in United States as a whole (see Chart 1). More than half (53%) of the state’s public libraries offer such a service, compared with just over one in five (22%) nationwide. This difference existed for libraries of all sizes. For instance, all public libraries serving at least 500,000 people in Colorado provided chat reference, compared with 72 percent nationwide, and the rate of chat refrence availability for libraries serving between 100,000 and 499,999 patrons was more than twice as high in Colorado than in the nation generally (89% versus 43%). The contrast between libraries in Colorado and those elsewhere is even greater when comparing smaller libraries. Colorado public libraries serving fewer than 10,000 people are over three times more likely to offer chat reference to their patrons than similar sized libraries throughout the United States (41% versus 13%). 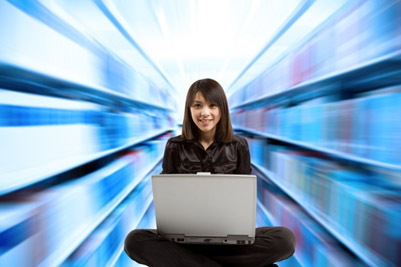 This high rate of public libraries providing chat reference in Colorado can be attributed mainly, if not wholly, to the presence of AskColorado, the state’s collaborative virtual reference services. In 2008, while some of the state’s public libraries use AskColorado in addition to another virtual reference service, only two Colorado public libraries were identified that provided chat reference but did not use AskColorado. The other area where Colorado’s public libraries significantly outperformed their counterparts nationwide was in the likelihood of its libraries to provide online access to their catalogs. An estimated 62 percent of public libraries in the United States allowed online catalog access; that number jumped to 73 percent for Colorado’s libraries. 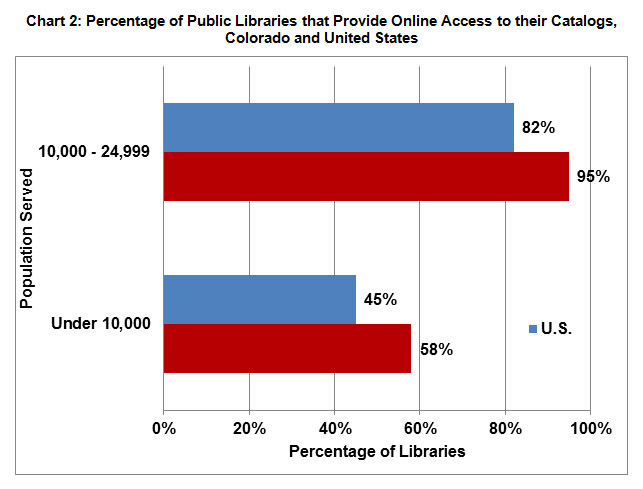 Again, Colorado outpaced the nation primarily among the smallest libraries (see Chart 2). Nearly all (95%) of Colorado’s libraries serving 10,000-24,999 people provided such access, compared with just over four out of five (82%) nationwide. Among libraries serving fewer than 10,000, 58 percent in Colorado provided online account access compared with 45 percent nationwide. For most other technologies included in the study, results for Colorado’s public libraries mirrored the nation-wide sample (see Chart 3). 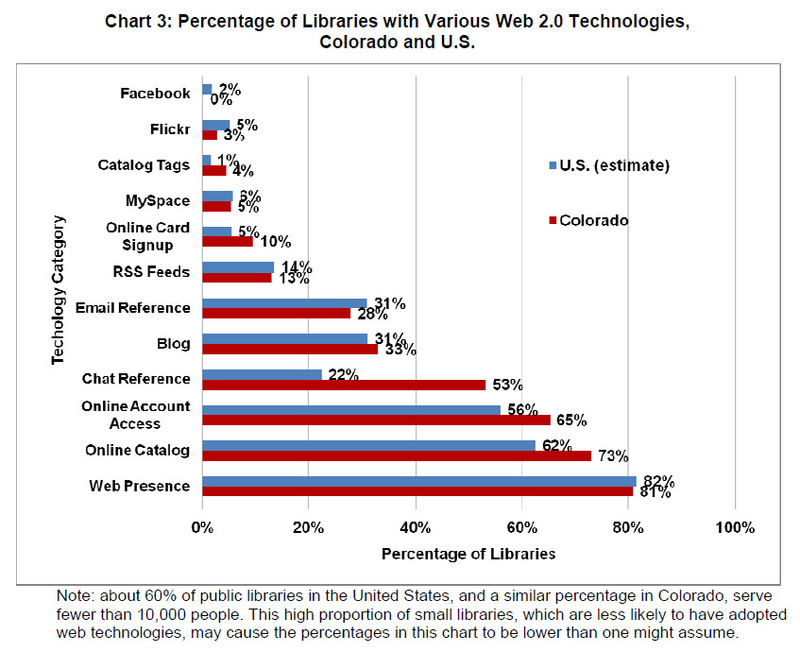 Though most libraries in Colorado had a web presence (81%), like their peers across the country, public libraries in Colorado were not likely to have ventured very deeply into Web 2.0 technologies at the time of the study. About a third of the public libraries in Colorado were communicating with their patrons via a blog or blogs, and roughly the same percentage explicitly allowed their patrons to send in reference questions via email. Presence in social networking spaces was nearly non-existent for Colorado’s public libraries, and though libraries in Colorado were slightly more likely to allow for tagging of catalog items than the rest of the nation as a whole, only four percent allowed this option. The fast-evolving nature of the web makes it difficult to determine which technologies are worth the investment of resources, and which are flashes in the pan. Public libraries in Colorado, like their counterparts throughout the United States, are still feeling their way through the wilds of Web 2.0,. One thing, however, is evident. When a path has been chosen, collaboration can be key in making progress. In this venue—with AskColorado and Plinkit as examples—Colorado’s public libraries are trailblazers.